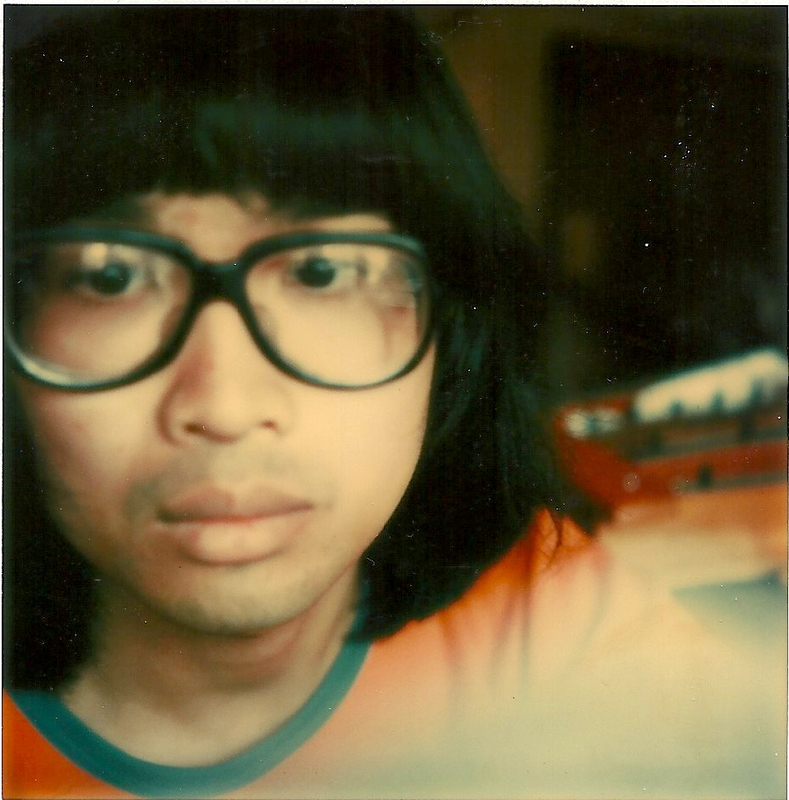 My mother was emptying out some old stuff in storage and I found some interesting old photos including this one, a polaroid of my young self, probably taken by myself on an SX-70. I only owned that camera briefly because my uncle Thongthow wanted it really badly and he bought it off me a month after I purchased it while on holiday in New York. 1975 was my last year at Cambridge and also the year that I wrote this piece, Views from the Golden Mountain, at the request of Witaya Tumornsoontorn, for the Bangkok Chamber Orchestra (a precursor of the Bangkok Symphony.) I'd just returned from representing Thailand at the Asian Composers' Conference in Kyoto (at 21, I had been the youngest person there by about 20 years) and had my first real critical success with a violin sonata called Cemeteries. Witaya asked me to do a piece that would be broadcast on Thailand's Army TV station, and he wanted it to be "really shocking" but simultaneously "clearly Thai." In fact he asked me to adapt one of the melodies of M.L. Puangroi and indeed took me to see her in order to get permission to use it. Doubtless he was expecting some kind of "arrangement" of the tune, with a few nice slippery impressionist harmonies ... the kind of thing that Hans Gunther Mommer, the local imported classical music celebrity, was doing with Thai traditional tunes. I took the piece in a completely different direction. I got the idea from standing in the windswept top of the Golden Mountain - then one of the tallest things in the city, though it is completely dwarfed now - and looking over the cityscape at twilight. Starting with an eerie, quasi-serial texture of solo strings, flute and harp (the harp part had to be carefully written as Thailand only had one harpist in those days) the piece started by evoking a sort of quasi-Bartokian (or perhaps George-Crumbian) night-music and then out of the ghostly miasma there finally came the sound of M.L. Puangroi's melody, played on a khong wong like a half-remembered dream. Well, the thing is, the two textures - post-serial and Thai - had never been pitted together before. There had always been the idea that Thai instruments would somehow have to be adapted (that is, retuned to a western scale) to blend with western instruments, or that western instruments would have to play Thai melodies with silly, illogical harmonizations. There had never been an attempt at synthesis in which each element completely preserved its own identity and aesthetic. That, you see, was shocking, and it was also "phid khru", meaning that it went against the handed-down teaching on traditional music and was therefore a violation of the ancestral precepts. The piece was played on TV anyway, during prime time (no soap operas to compete in those days!) and M.L. Puangroi was reportedly pretty shocked (though later on she took it in stride). One viewer called the station to say that the music had got a dog to start howling outside and that he had thought it was part of the piece. Nop Sotthibandu, the famous Thai jazz violinist, said that ghosts of old Bangkok actually came out of the TV screen. The piece was, indeed, infamous. And it was also a piece that could not exist without Thai-ness specifically, because later that year the piece was performed at the Asian Composers' Conference in Manila, and there was no khong wong. Instead, a gamelan instrument was used and it was not of course tuned in the specifically Thai way. The entire piece fell, to my mind, completely flat, which was embarrassing since it was played in front of several major world composers. In fact, I said it was a lousy piece in front of a bunch of them. Jan W. Morthenson, well known Swedish composer, said "Don't worry, Somtow, we all have them." Lou Harrison, the perhaps much more well known American composer, said, "Nonsense, Somtow. It's a lovely piece." It has not been heard since then. Now, if musicologists follow the sequence of events properly, they will see that View from the Golden Mountain has turned out to a piece of huge historical import. What was shocking in 1975 is commonplace today. The fusion of Thai and western in musical forms has permeated to the level of pop music and film music, and no one would think of decrying it as sacrilegious or against traditionalism. I was not in Thailand to see the revolution work out, however. After pieces like Views and the considerably more fully-imagined Gongula were done, and after Bruce Gaston, Dnu Huntrakul and I created more such pieces and battered ourselves against the walls of public ennui and critical vitriol, I burned out. It took me only about 3 years for me to pack up and go into the sunset ... literally heeding the traditional command to "Go west, young man." In a sense, all three of us "sold out" - the others heading towards the more profitable vineyards of populism and commercial music, I towards an even stranger future as a novelist. The revolution took its own good time. It happened without any fuss, while our backs were turned. Today, musicians in this country do not even know that a revolution had to occur for them to be able to play and create music the way they can today. And that of course is the mark of a true revolution; once it has occurred, all memory of it should fade away. Or, as Karl Marx put it, "wither" away. I myself will not step in that river a second time. I have said all I needed to say in that idiom and reinvented myself as a "kinder, gentler" composer. But seeing this picture of my sweet, sensitive self, before I became corrupted by time and doubt, made me think of that piece again. It may be time to bring it back. I wonder if it would hold up.